I wasn’t sure what I wanted to write about this week. We are too far off to begin to ramp up for the riding season. The Icicle is a month and a half away. The Annual Banquet two and a half weeks. During last night’s monthly Club meeting it came to me. We had a discussion about a recent closing. Wooden Wheels closed their Concord Pike location a few months ago and then within the past few weeks suddenly closed their Newark store. I don’t know the whole story and if I did wouldn’t post it here, but it got me thinking about losing an established part of the cycling community. Wooden Wheels had been around for more than 40 years, providing sales and service to cycling enthusiasts – and now that entity is gone. I assume the economy probably had something to do with the closing. How online sales are affecting the brick and mortar stores. How the convenience of online shopping, free shipping and reduced prices can be very enticing, but we need to also consider the consequences. The loss of local bike shops not only hurts the local economy, but it hurts us as cyclists. Yes, you may be able to save some money by buying that part or that apparel online, but can you test ride that bike before buying it? Can you try on those shoes before handing over your money for them? Can you place an order at 3:30 on a Saturday, have what you need in hand at 3:45 so you make the 8:00 am ride Sunday morning? Can you go to your online store with your bike making a funny noise “when I do this”, and have the mechanic tighten a bolt and send you on your way 15 minutes later? I don’t think you can, matter of fact I know you can’t. What you can do is walk into your local bike shop with a bike that needs an adjustment and roll out ready to hit the road or trails. You can walk into the local bike shop and walk out with a new spoke and a chain whip to fix your rear wheel. You can test ride that nice new shiny bike and try on those new clipless shoes before you put down all that money knowing that if you were to have a problem with the fit, you could go back to the local bike shop and they would make it right for you. And let’s not forget about that relation you’ve developed with that one mechanic that always fixes your bike just right or the store manager who goes out of his/her way to acknowledge you each time you walk into the store. You don’t get that from your web browser. We, as s community of cyclists, have to remember that the community is not only made up of cyclists, but those that support us. That without their support it may be difficult for us to do what we like to do. 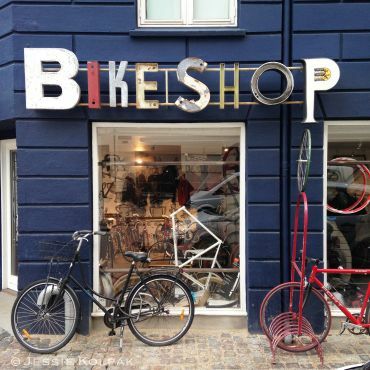 Local bike shops provide that support through sales and services and we need to support them in kind. Keep that in mind the next time you are online line and considering making that $100 purchase, saving $15 or $20. Consider whether you can spare that $20 to help to support those that are only there to support us. It’s a two way street, unless we support them, they will not be there to support us. ← Wanna go to the Movies? ?